We’d love your help. Let us know what’s wrong with this preview of Dieter Rams by Sophie Lovell. Dieter Rams is one of the most influential product designers of the twentieth century. Even if you don’t immediately recognize his name, you have almost certainly used one of the radios, clocks, lighters, juicers, shelves or hundreds of other products he designed. He is famous not only for this vast array of well-formed products, but for his remarkably prescient ideas abou Dieter Rams is one of the most influential product designers of the twentieth century. Even if you don’t immediately recognize his name, you have almost certainly used one of the radios, clocks, lighters, juicers, shelves or hundreds of other products he designed. He is famous not only for this vast array of well-formed products, but for his remarkably prescient ideas about the correct function of design in the messy, out-of-control world we inhabit today. These ideas are summed up in his ‘ten principles’ of good design: good design is innovative, useful, and aesthetic. Good design should be make a product easily understood. Good design is unobtrusive, honest, durable, thorough, and concerned with the environment. Most of all, good design is as little design as possible. To ask other readers questions about Dieter Rams, please sign up. 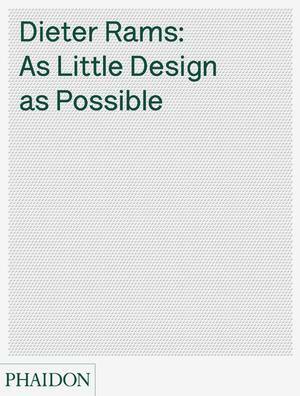 As a person who paid little attention to Dieter Rams before, this was an eye opening and informative book. It incorporates a brief background on Dieter Rams, the formation of Braun, and details on a number of the products Dieter was a part of. The sections that talk about the products can feel a bit dry at times. All are worth reading for the stories behind the creation of the products. Some more rich and interesting than others. They are accompanied by marvelous photos. The pictures of Dieter's As a person who paid little attention to Dieter Rams before, this was an eye opening and informative book. It incorporates a brief background on Dieter Rams, the formation of Braun, and details on a number of the products Dieter was a part of. The sections that talk about the products can feel a bit dry at times. All are worth reading for the stories behind the creation of the products. Some more rich and interesting than others. They are accompanied by marvelous photos. The pictures of Dieter's home were probably the most interesting. The final section that talks about Dieter's thoughts on various topics, and the evolution of his design principles are gold. Every designer should buy this book to learn from the lifetime experience of Dieter. I most appreciate that the book talks a lot about how design exists in the real world. And how it takes a team to turn a product into a reality. I appreciate Dieter Rams infinitely more than I did before as a result of this book. Every Designer should read it, at the very least, read the last section of the copy sitting in your friends library. A very well written book that explores the logic and ethos behind close-to-perfect Braun products. Amazing look into Rams industrial design development and the history of Braun from the lead up by Bauhaus to his final work. First impressions: One of the worst dust covers I've see. Malodourous plastic which, nicely detailed & printed, is entirely unsuitable for a dustcover, because apart from smelling like a cheap action figure left in the sun it immortalises every little dent along its edges, fits too loosely to offer any convincing degree of protection. I was very unimpressed with the thin grey card sleeve on Kemp's "Less and More", but this is worse. I hope if Phaidon do another run of these they'll just drop First impressions: One of the worst dust covers I've see. Malodourous plastic which, nicely detailed & printed, is entirely unsuitable for a dustcover, because apart from smelling like a cheap action figure left in the sun it immortalises every little dent along its edges, fits too loosely to offer any convincing degree of protection. Most of the information in this book can be easily found elsewhere online in greater detail and depth. The most valuable parts of the book are those that give a historical and cultural context of the principles that shaped Dieter Rams's' thinking and work. Covering all objects and all aspects of Rams' career. 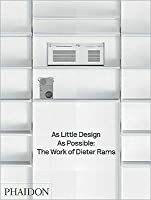 Excellent book on Dieter Rams' products and philosophy. It is an inspiration to both read and to experience the beautiful photography. It was a lot more about Dieter Rams than design in general. Still a worthwhile read, but not what I expected. I read parts of it while researching Dieter Rams for a blog. Loved the presentation, writing and inspiring work compiled into this book.